7.5 inches (19 cm) from cuff to top of heel, 2 inches (10 cm) heel flap. Length of foot is variable. 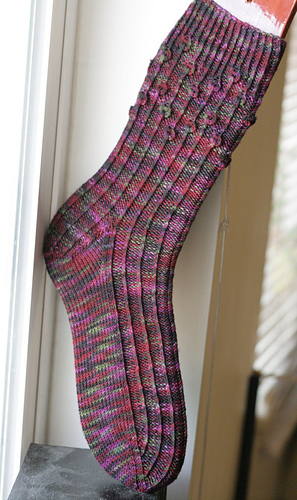 This pattern was originally designed for the Knit Purl Sock Club, November 2009 offering, the original yarn is Abstract Fiber Supersock in ‘Pinot Noir’. Vitis Vinifera is the botanical name for the grape vine. These socks feature a stretchy twisted rib pattern that begins at the cuff and travels all the way down the toe. 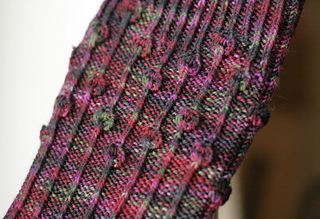 The cuff detail is reminiscent of grape clusters on the vines for which the sock is named. These socks are knit from the cuff down to the heel in a twisted rib pattern. 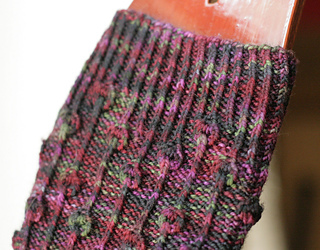 A heel flap is then worked on approximately half the stitches. The heel is turned, and then stitches are picked up on the selvedge edges of the heel flap. Work is rejoined in the round and the gusset decreased. The foot is worked even until it measures 1.5 inches (3.8 cm) short of total foot length and then a wedge toe is worked, while continuing the twisted rib down the top of the toe to the very end. Live stitches are then grafted together to close the toe using kitchener stitch. Yarn: 380 yds of sock weight yarn. Sample shown in Knitted Wit Victory Sock (80% Merino wool/20% Nylon, 420 yards/4 oz) in Colorway ‘Beaujolais’. Gauge: 16 sts and 24 rounds per 2 inches (5 cm) square in twisted rib pattern after blocking. Notions: stitch marker to mark beginning of round. Tapestry needle for grafting and to weave in ends. Needles: 2.25mm (US 1) needle(s) or size needed to obtain gauge. Use your preferred method for small circumference knitting: e.g. double points, magic loop or two-circulars. Finished Size: 7.5 inches (19 cm) from cuff to top of heel, 2 inches (5 cm) of heel flap. Length of foot is variable.